First let me tell you about Julie Manet and that’s Julie with a long sweet “J” like Jacque not Jack. I wish you could hear Noemie from Eric Gillis gallery in Brussels say it “en Francais”. She introduced me to Julie last year and when I wanted to follow up, I had misplaced Noemi’s card. When you see something you like at an art or antique show and you hesitate, you often miss out. You come back and that spot on the wall or on that shelf is empty and I believe there are many dealers who take glee in scolding you. It’s the “Oh no, I sold that. You should have bought it when you saw it.” Well I am very happy to say that I came back and she was not gone. Impressionism was born in Paris in the 1860’s and in the beginning there were Claude Monet, Auguste Renoir, Frederick Bazille and Alfred Sisley. They were soon joined by Camille Pissarro, Edouard Manet, Berthe Morisot, Edgar Degas, Paul Cezanne and others. 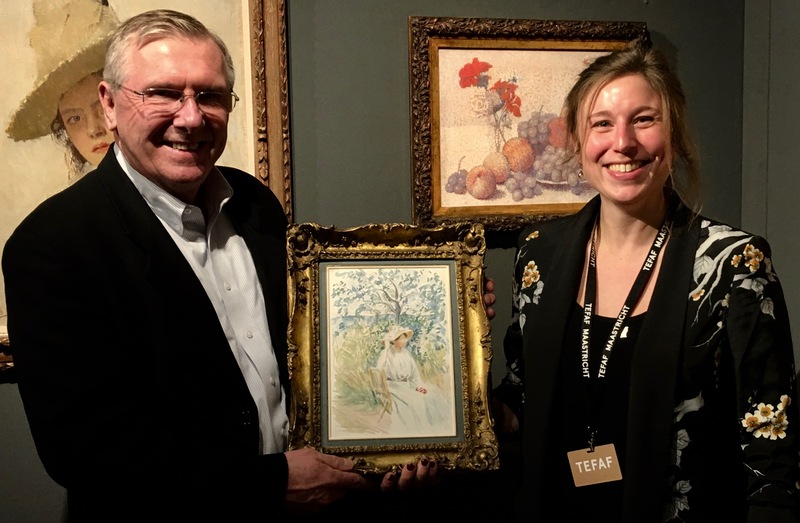 They favored painting “en plein air” or outdoors and their goal was to focus on the light and color and to try to achieve an overall visual effect rather than focus on the representational details so evident in the works of their predecessors. These Impressionists changed the world of art forever. Edouard Manet had a brother Eugene and he can be seen as the gentleman sitting on the right in Manet’s famous (or infamous) “Dejuener sur l’herb” or luncheon on the grass. Eugene Manet later married his brother Edouard’s Impressionist painter friend Berthe Morisot and they had one child and they named her Julie. When her father Eugene died in 1892 and her mother Berthe died in 1895 she was left an orphan at 16. She was looked after by her cousins family and her uncle and his artist friends, in particular Auguste Renoir. 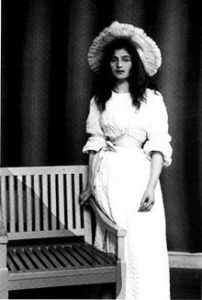 She was a beautiful girl and Julie may be found as a model in more Impressionist’s painting than anyone else starting from the time she was a young child. 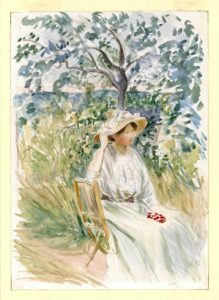 She was an artist and she was famous for her memoirs “Growing up with the Impressionist” which is about to be published this summer in a new edition which will now include her letters and an image of this painting. Julie painted this lovely watercolor of her cousin Paule Gobillard in the style of her mother, in Monet’s garden in Giverny in 1897 when she was 18….This time there was no hesitation on my part and I bought it. I have one last tale for you about what you can see at TEFAF. There is a Antique Jewelry section and I have always been fascinated by the beauty of this art. One pin got my attention this year and I knew had to know the story so I uttered the magic words “What can you tell me about this?”. I cannot begin to quantify the knowledge I have gained and the friends I have made over the course my life by simply posing this question. Whether it is business or pleasure, these words spoken to an “expert” have literally altered the course of my life on more than one occasion. This time I asked that meaningful question in the stand occupied by Wartski Jewelers of London. I later discovered that the man I spoke with was the Director of the firm, Kieran McCarthy who is also a member of the advisory board of the Fabergé Museum in St. Petersburg. Wartski has been in business for 152 years since 1865 and has been selected as a Jeweler for the Queen and H.R.H. The Prince of Wales. When I asked Kieran that magical question about the “Cicada” his eyes lit up. His enthusiasm was obvious and I could not wait to hear what he had to say. First let me show you the pin and then I’ll tell you the story. Don’t forget you can blow this image up by clicking on it once and then clicking again for an even larger picture. The confusing background is a whiteboard with a photo of the pin on it. Kieran began… this pin was created in about 1890 by the famous master jeweler Frédéric Boucheron who began the “House of Boucheron” in 1858 in Paris. 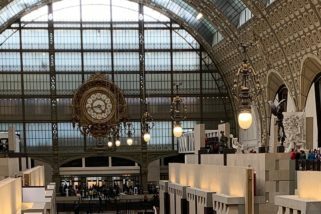 He founded this French family dynasty with the opening of his first store in the Galerie de Valois, at Palais-Royal, during the heyday of the Second French Empire. In 1893 Frédéric Boucheron became the first jeweler to move to 26 Place Vendôme, where Boucheron and many other fine jewelers remain to this day. The records indicate that he made four very similar Cicada pins, but because of the delicate nature of the wings, this one seems to be the only one to have survived. First Kieran explained about the diamonds and sapphires set in silver that make up the body and the head with those little sapphire eyes and gold antennae and then his voice picked up a little. 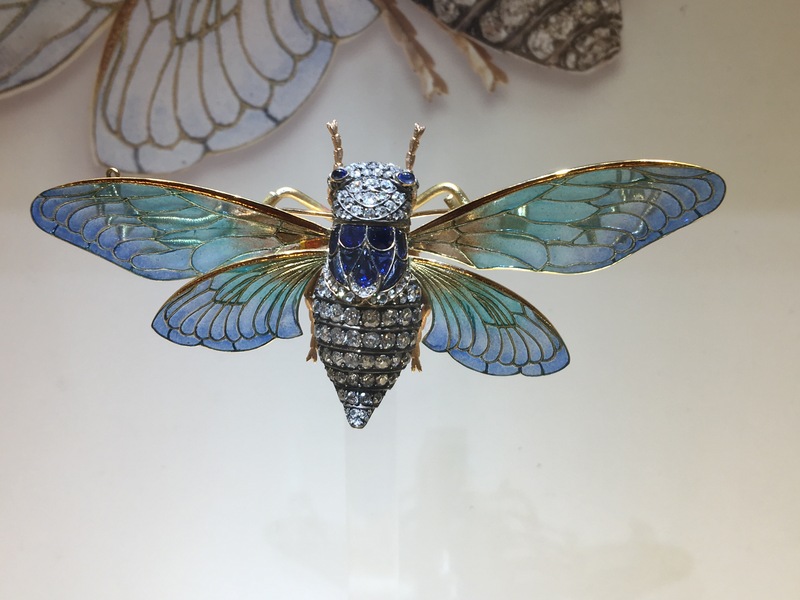 It was as if he was saying there were a few people that could have made that body in 1890, but the wings, that is a different story and they are truly a fine example of the creativity and mastery of Frédéric Boucheron. 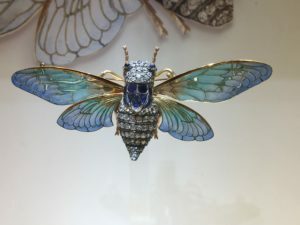 The translucent iridescent wings are enamel which essentially a glass powder that has been fired and melted and the partitions, or “cloisons” in French are made of fine gold wire. Sounds good to me, but wait, how do you fire and melt the enamel and not the gold? The second big problem is how do you keep the melted enamel in place in a thin translucent sheet? After what must have been many trials and many failures Frédéric figured out how to produce these wings. He would build the skeleton of the wings on a thin sheet of copper using the gold wire for the cloisons or partitions. Then he would put the appropriate amount of glass powder in each section and gently put this into a kiln. He knew that the glass powder would melt and flow into a delicate thin sheet on the copper at 1500 degrees F and he also knew that the gold would not melt until 1700 degrees F. The copper was okay up to 2000 degrees F. There were no electric temperature controlled kilns in 1890 as light bulbs in the home were only a few years old, but from centuries of pottery making people had developed several methods to control the temperature in a kiln so Monsieur Boucheron could get to the necessary 1500 degrees F and stop without reaching the 1700 that would melt the gold. Okay, now you take this sheet out of the kiln and there are your beautiful Cicada wings, but unfortunately they are stuck to the sheet of copper. Not to worry because you just happen to have some nitric acid handy and guess what, nitric acid will dissolve copper, but it will not harm the fine gold or the enameling. You just put the whole thing in a nitric acid bath and come back in a little while et voila! I do not mean to bore you, but ladies what if you are wearing the Cicada at a party and someone says what a beautiful pin and then they ask you how they made those wings? Now you will be prepared and if I were you I would turn and walk away right after the “et viola”. They may notice your Cicada wings fluttering slightly. Did I mention they were mounted on little gold springs? All things considered, 180,000 euros or just under $200,000 seems fair to me. Where else besides Maastricht can you have a discussion about the merits of a Giacometti sculpture or a Picasso painting from the 1930’s then select a glass of champagne off of the lovely lady’s tray and wander over a couple aisles and have a conversation with a member of the advisory board of the Fabergé Museum in St. Petersburg about a Cicada pin?… The answer is nowhere else! I love this place, but tot ziens Maastricht, bonjour Paris!